More of a grown-up than a kid? This has come around WAY too soon for me. It’s May first AGAIN. Another year has passed, and it’s time for me to remember that day that I lay prostrate in a hospital bed, doped up on Morphine, and listened to a high-risk OB/GYN explain with remarkable calmness that 33 weeks or not, this baby was coming today. 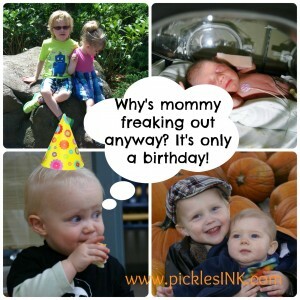 Why’s mommy freaking out anyway? It’s only a birthday! 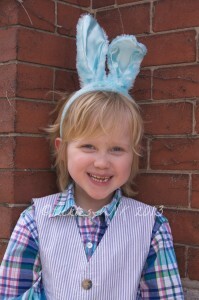 Ben-Magoo, I simply refuse to believe that you are now SEVEN. YEARS. OLD. It simply isn’t possible. I forbid it. You must stay my baby forever. I know, I know…you SAY that you’ll always be my teeny baby, and you’ll ALWAYS want mommy cuddles, and you’ll ALWAYS be my same silly Ben-Magoo, but SEVEN? You’re practically a teenager. I mean, just look at your hair! Teenager hair, that is. And listen to you talk – teenager talk, that…no, scratch that. You talk like a grown-up with a post-graduate degree. Ben-Magoo, you asked me some questions this morning, and I think I did a pretty good job of answering them, so I’m going to write down what I can remember here to make sure you can re-read it any time you want to. We started out talking about your birthday presents – You got a few presents this morning that I picked up yesterday at the Royal Botanical Gardens – some pretty cool bug books, one from the grown-up section, because most of the kids books were just way too, as Molly put it, “kiddy” for you. You were a little disappointed that you didn’t get any ocean books, but I explained that right now you seem really focused on your Bug Clinic. 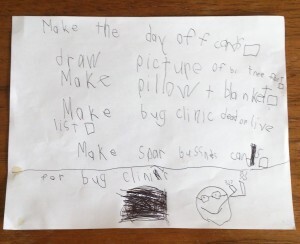 Just in case you’re reading this years from now and can’t remember, let me remind you about your Bug Clinic. Last year at daycamp, you and your friends noticed that there were a lot of caterpillars around and you wanted to do something for them, so you created a bug hospital at the base of a tree. You carefully brought any injured caterpillars you found there, and you collected a stockpile of carefully peeled maple seeds for caterpillar food. What’s even cooler, Magoo, and I don’t think you realize that you do this, is how huge your heart is. You don’t just accept everyone who comes along – you find ways to bring people together. When some of your friends were more interested in playing Minecraft than Bug Clinic, you invited them to make a Minecraft tower on the top floor. When we had that incident a couple of weeks ago where another student made a poor choice and deliberately threw away the special piece of coral you brought to school, and later offered to work at your Bug Clinic to make up for it, you not only accepted her offer, you named her the “First Prize Winner” at your latest Bug Clinic Award Ceremony. I mean, there’s forgiveness, and then there’s what you did. You have so much goodness in you that you respond to a deliberate injury by simply loving MORE. I think there’s a lesson in there for all of us. You’ve been telling me that the Bug Clinic is a secret, but this morning you changed your mind and said it was okay for me to talk about it, and I’m really glad because I want to share it with the world. If more six…no, SEVEN year-olds were as dedicated as you are to caring for the very tiniest of creatures on this earth, how amazing would your generation become? Magoo, every once in a while you and me have these really profound talks, and this was one of them. I said that there are a lot of reasons. There’s the ordinary reasons: We tried to expose you to lots of different playthings and experiences, not just superhero toys and sports. Honestly, you never had much interest in any of the sports we tried (“Except skiing! I really like skiing!” you point out), so we weren’t going to force it, as long as you’re active and healthy. And whatever toys you played with, you created your own worlds with them instead of being stuck “in the box” playing with them exactly the way they were intended. Just think about Brio Peak – Your track-building adventures rose (again, literally) to new heights, and led to your first published book! Likewise, you don’t watch the typical TV shows for your age and gender, and I’m actually pretty happy about that. We’ve talked about this before, but with your innate kindness, and your tendency to be a bit anxious, you don’t like shows or movies with shooting and meanness, even if they do have happy endings. You just don’t enjoy watching them, and that’s okay. You get a little frustrated with your friends sometimes when they tell you the shows you like to watch are babyish, but you never fail to remind them “That’s a STEREOTYPE.” I do get a little sad because I know you censor yourself and don’t talk about those shows at school so you don’t get teased, but that of course is not a problem with you but with the world, and it’s not your job to fix it! You interrupted me here to say, “It was when we were watching the life cycle DVD about the dolphin and the shark and you got the Eugenie Clark book and read it to me! THAT’S when I started loving ocean creatures!” and I’m pretty sure you just wrote the first sentence in your autobiography. Well, that got me thinking and talking about the not-so-ordinary reasons. Eugenie Clark started being interested in natural science and ichthyology when she was very young, just like you, and I think you’ll find that the same is true of many scientists and leaders in their fields. People who have a passion for something often came to that passion very early in life, and many of them were lucky enough to be encouraged in that passion from early on. 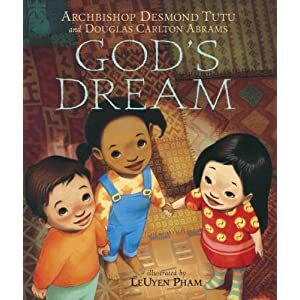 So you might be different from the other kids because God has a plan for you to do something really special – like to become a marine biologist or entomologist – or even something else. One of the things that is really, really cool about you, Magoo, is that you don’t just get excited about things yourself – you have an incredible gift for getting other people excited too. Just look at your Bug Clinic – even though most of your friends are more interested in the usual stuff, you have somehow managed to get them totally excited about the Bug Clinic. When you started drawing ocean creatures, all of your friends did the same thing and for weeks you came home with your backpack stuffed with drawings of sea life – “To Ben, From _____.” Maybe you’re going to wind up using that gift to make a difference by getting people excited about learning or about conservation. That, of course, led to a conversation about conservation (say that 5 times fast!) and a decision to write a letter to your principal outlining ideas for improving your school’s Enviro Club (“All we ever do is collect the recycling bags from the classrooms and dump them in the bins!”). Oh, and you remembered that you’d better get started with your letter-writing campaign to Marineland. And I promised to tell you about Craig Kielberger later. I guess Free The Children will be next on our reading list. As we walked from the parking lot into your school, Magoo, you pointed at yourself, grinned at me, and said, “This kid is more like a grown-up than a kid,” and then ran inside to show off your birthday cupcakes. I’ll have to meet you halfway on that, my baby Ben Magoo. 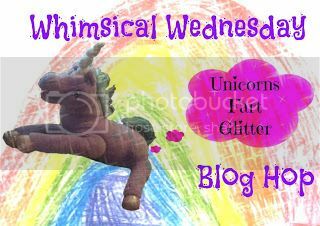 Today I have invited a guest poster, Ben Pickles (age 6), to share some of his thoughts with you. Ben is 6 years old. Last year at school he was in Montessori. This year he is going into Grade 1 in French Immersion and he has started riding the school bus! He is excited to use his new Angry Birds pencil case and Angry Birds pens from his Aunt Yen Yen. 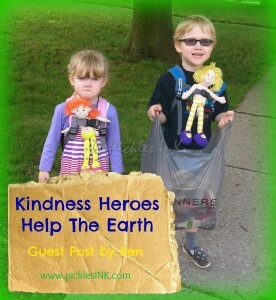 Ben has guest-posted before on PicklesINK and also on Raising Wild Things. He is the author of Your Brio Peak Story Collection. 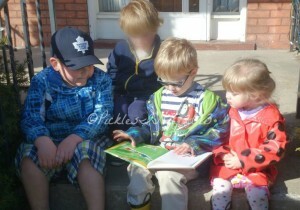 One of Ben’s favourite books and movies is The Lorax, and Ben likes to help the environment just like the Lorax does. In the future Ben plans to be a premier of a province called Benville. Benville will be environmentally friendly, with wind turbines and solar panels to make electricity so we do not have to burn coal and oil and gas that makes air pollution. Litter is garbage that people throw on the ground instead of throwing it out or recycling it. When I see litter, I feel like I should pick it up. I think that sometimes people throw things out of their cars because the cars will just run over them. A little while ago, mommy, Molly and I were walking to the mailbox and the library. I saw some litter on the ground and I wanted to pick it up and carry it to a garbage. 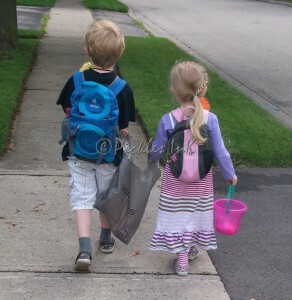 Mommy had two bags – one was a throw-outable bag and one wasn’t, so we put her letters in the other bag and used the throw-outable one to carry the litter so we could just throw out the bag with the litter when we got to the library. On the rest of the walk downtown, we saw some more litter so we decided to pick up all the litter that we saw. Molly and I worked as a team – I held the bag and I showed Molly the litter and Molly picked it up and put it in the bag because I didn’t like the stinky smells. When we got downtown the bag was full of litter and we put it in the garbage at the library. 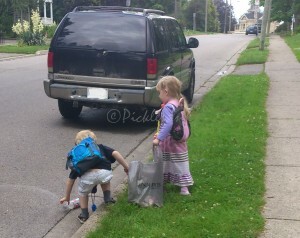 We decided that every time we go on a walk we will bring a bag to pick up litter. The thing that people litter most is cigarettes. I have seen that there are garbages for them, but people just litter them, and they have already done something that is not good for the environment – polluted the air with smoke. 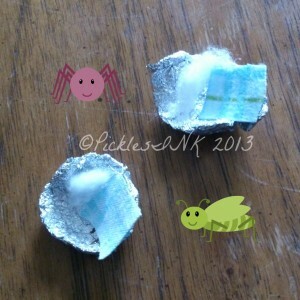 I wish I could pick up the cigarettes but they are too germy. I wish people who smoke cigarettes would put them into garbages instead of littering. I like picking up litter, but I still wish that there wasn’t so much litter because litter pollutes the Earth. I wish that people would hold onto their garbage until they find a garbage or a recycling box to put it in because that would be nicer to the environment. I would like to ask everyone who reads this blog post to pick up one piece of litter today and put it in the garbage (or if you find a box or can or anything that needs to be recycled find a recycling bin). Remember the 3 R’s – Reduce, Reuse, Recycle! the earth will get better. The land will be cleaner. The soil will be wetter. The sun will shine brighter. The trees will be greener. The sky will be bluer. Show Ben some Comment Love here!! I am not Trayvon Martin’s mother. Ian is not Trayvon Martin’s father. And Ben will never be Trayvon Martin. Ben will never know the feeling of being looked on with suspicion as he walks down the road at night (or any time). I will never worry, when wondering why Ian isn’t home yet, that he has been stopped without cause and shot by police while reaching for his license. Listen, I’m gonna be honest with you, and this is a practice that I engage in every time I am stopped by law enforcement, and I taught this to my son who is now 33 as part of my duty as a father to ensure that he knows the kind of world in which he is growing up. So when I get stopped by the police, I take my hat off and my sunglasses off, I put them on the passengers’ side, I roll down my window, I take my hands, I stick them outside the window and on the door of the drivers’ side because I want that officer to be as relaxed as he can be as he approaches my vehicle. And I do that because I live in America. We will never have to worry about Ben being shot by a stranger, not because he was in the wrong place at the wrong time, but because he was in a place he had every right to be, at a time he had every right to be there, but was born with the wrong colour skin to be able to safely assert those rights. And if, God forbid, and I’m having trouble even typing this out, one of my children ever was murdered, it wouldn’t even cross my mind that the person responsible would walk free, smiling smugly, his or her supporters celebrating with fireworks displays, with the story of the verdict relegated to a tiny square below the (virtual) fold while the lead news story bemoans the untimely death of a troubled young (white) TV star. Because we are white, we don’t live those realities. Our reality is very different. Heck, if I decided to steal a bike and freely admitted to it when questioned, people would probably offer to help me do it. So what I am going to do about it? I’m going to name my privilege. I’m not going to hide behind, “But I’m not a racist,” because that’s not good enough. The world I live in is oppressive, and I benefit while others are oppressed, and if I don’t recognize that and call it out, I am complicit. I am not going to teach my kids colourblindness, because that’s not good enough either. They need to know that actually, we’re not all the same regardless of the colour of our skin. The way we are treated by the world is different because of the colour of our skin, and that is not okay. 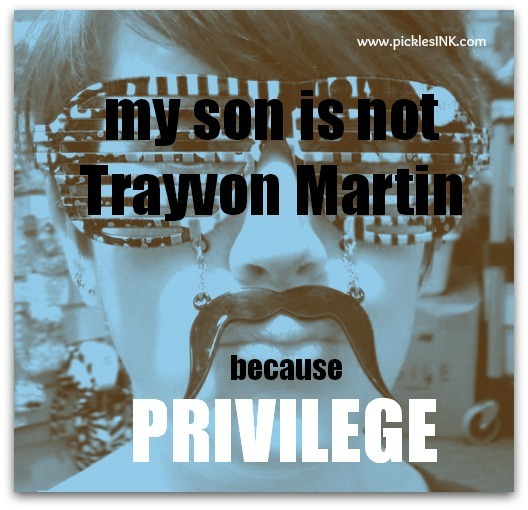 I’m going to name privilege and oppression where and when I see them, and teach my children to do the same, because although it may make me uncomfortable, it’s nothing compared to what Trayvon Martin’s mother and father had to do. How do you talk to kids about race? This guide can help. Please feel free to comment with any more resources that you know of or have found helpful. What’s a penguin to think when he wakes up PINK! Molly made a great book find at the library the other day – she was attracted to it by the cover (“Mommy, can you read my pink book? Can you read this my pink book? That is my pink book! 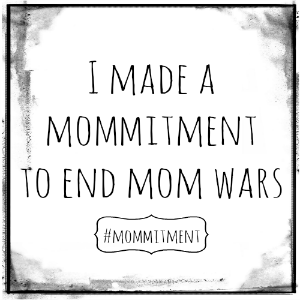 !”) but it turned out to be cute and topical. PINK! 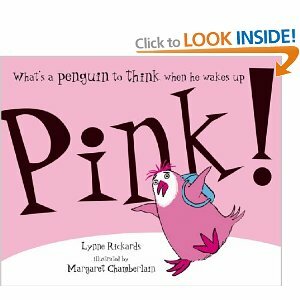 is the story of a penguin named Patrick who wakes up one morning to discover that he has turned pink. When he finds himself being teased at school, he decides to go and live with the flamingos, but finds that he doesn’t fit in there either. He returns home where he finds that his friends and family are happy to have him back and want to hear all about his adventures. It’s a really nice story – well written, doesn’t hammer the points home over and over as some children’s books are wont to do, and was simple enough to keep Molly interested with a meaty enough story to engage Ben as well. In fact, at bedtime last night we read it twice. In a row. And I still like it. Can there be a better recommendation than that?